A new Office 365 threat has been detected that stealthily installs malware by hiding communications and downloads by abusing legitimate Windows components. The attack starts with malspam containing a malicious link embedded in an email. Various themes could be used to entice users into clicking the link, although one recent campaign masquerades as emails from the national postal service in Brazil. The emails claim the postal service attempted to deliver a package, but the delivery failed as there was no one in. The tracking code for the package is included in the email and the user is requested to click the link in the email to receive the tracking information. In this case, clicking the link will trigger a popup asking the user to confirm the download of a zip file, which it is alleged contains the tracking information. If the zip file is extracted, the user is required to click on a LNK file to receive the information. The LNK file runs cmd.exe, which executes a Windows Management Instrumentation (WMI) file: wmic.exe. This legitimate Windows file will be used to communicate with the attacker’s C2 server and will create a copy of another Windows file – certutil.exe in the %temp% folder with the name certis.exe. A script then runs which instructs the certis.exe file to connect to a different C2 server to download malicious files. The aim of this attack is to use legitimate Windows files to download the malicious payload: A banking Trojan. The use of legitimate Windows files for communication and downloading files helps the attackers bypass security controls and install the malicious payload undetected. These Windows files have the capability to download other files for legitimate purposes, so it is hard for security teams to identify malicious activity. This campaign targets users in Brazil, but this Office 365 threat should be a concern for all users as other threat actors have also adopted this tactic to install malware. Due to the difficultly distinguishing between legitimate and malicious wmic.exe and certutil.exe activity, blocking an office 365 threat such as this is easiest at the initial point of attack: Preventing the malicious email from being delivered to an inbox and providing security awareness training to employees to help them identify this Office 365 threat. The latter is essential for all businesses. Employees can be turned into a strong last line of defense through security awareness training. The former can be achieved with a spam filtering solution such as SpamTitan. SpamTitan will prevent the last line of defense from being tested. Microsoft uses several techniques to identify malspam and prevent malicious messages from reaching users’ inboxes; however, while efforts have been made to improve the effectiveness of the spam filtering controls of Office 365, many malicious messages are still delivered. To improve Office 365 security, a third-party spam filtering solution should be used. SpamTitan has been developed to allow easy integration into Office 365 and provides superior protection against a wide range of email threats. 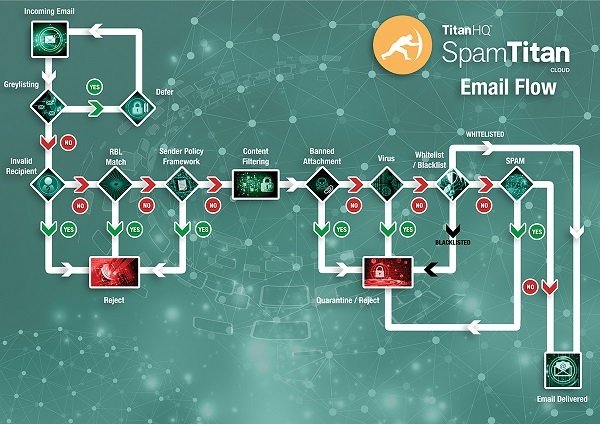 SpamTitan uses a variety of methods to prevent malspam from being delivered to end users’ inboxes, including predictive techniques to identify threats that are misidentified by Office 365 security controls. These techniques ensure industry-leading catch rates in excess of 99.9% and prevent malicious emails from reaching inboxes. Many MSPs resell Office 365 licenses to their customers. Office 365 allows MSPs to capture new business, but the margins are small. By offering additional services to enhance Office 365 security, MSPs can make their Office 365 offering more desirable to businesses while improving the profitability of Office 365. TitanHQ has been developing innovative email and web security solutions for more than 25 years. Those solutions have been developed from the ground up with MSPs for MSPs. Three solutions are ideal for use with Office 365 for compliance ad to improve security – SpamTitan email filtering, WebTitan web filtering, and ArcTitan email archiving. By incorporating these solutions into Office 365 packages, MSPs can provide clients with much greater value as well as significantly boosting the profitability of offering Office 365. To find out more about each of these solutions, speak to TitanHQ. The MSP team will be happy to explain how the products work, how they can be implemented, and how they can boost margins on Office 365.